NextGen Player - Canada's Premier Entertainment Blog: It's Hears(eh): Are These Best Buy's Boxing Day Gaming Deals? It's Hears(eh): Are These Best Buy's Boxing Day Gaming Deals? New feature time! If there is one thing we love in the gaming industry, it's an unverified, potentially bogus rumour that sparks our interest and teases our imagination. To satisfy these cravings we've created a new feature on NextGen Player aptly named It's Hears(eh). A poster on the Canadian deal forum Smart Canucks has posted what appears to be a scan of Best Buy Canada's Boxing Day gaming deals. The scanned flyer apparently was posted by a Best Buy employee on the Dealcatch website. 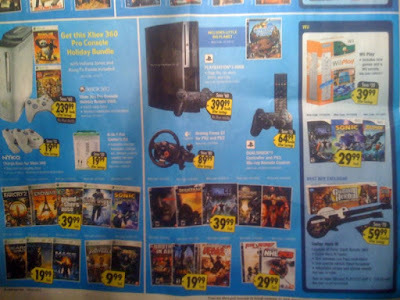 According the flyer, Best Buy will be having deals on Xbox 360 Pro bundles, Playstation 3's bundled with LittleBigPlanet, and plenty of video game price reductions. For a complete list of the deals and the scanned flyer check out the Smark Canuck's website here. I can confirm this flyer is for real. Another deals site in Canada - Red Flag Deals has also posted this and other Boxing Day deal flyers. Futureshop's flyer is also there. Is this also for the States or Canada only? Best buy has had their boxing day flyers online since 12:01AM this morning. No need for questionable crappy scans. Click "Weekly Ad", enter postal code, choose the boxing day flyer. Damn that's a great deal on the Xbox 360! Its a true story. You can go to www.bestbuy.ca and click on the BOXING DAY FLYER, and its the exact one. Hope this helps to confim for everyone.